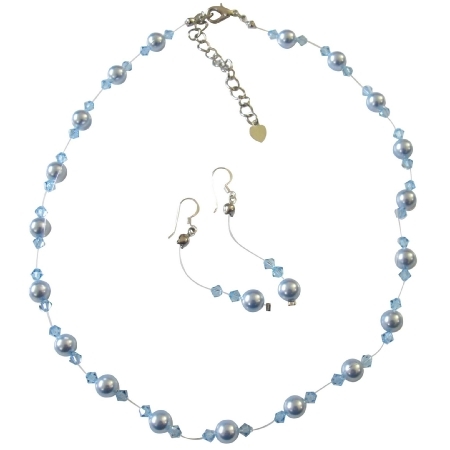 Subtle & elegant this necklace is crafted with an invisible strand featuring beautiful Swarovski Blue Pearls & Aquamarine Crystals. This necklace is the perfect addition to your wedding prom or homecoming. Fine invisible necklace gracefully floating pearls around your neck at affordable with Sterling Silver 92.5 hook earrings. Material Used : Swarovski Blue Pearls 7mm with Aquamarine 4mm bicone crystals. Earrings Sterling Silver 92.5 hook with string dangling pearl & crystals.